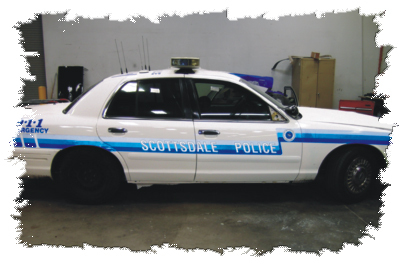 Making public safety vehicles look professional is a top priority for Speed Demon HRS. Digitally-printed Graphic Kits propel your agency into a new era. Professionally designed exclusively for Public Safety agencies, each kit uses a combination of Scotchlite reflective and Scotchcal non-reflective vinyl – offering immediate recognition and a higher level of officer safety. Each kit is available with your choice of agency name and title, personalized shield and emergency phone number. We can also supply a “custom message” for the front or back fender. The custom message is ideal for service mottos, a website address, or non-emergency contact information. Professional installation recommended. We can install in the Spokane/Coeur d’Alene areas and we can ship throughout the U.S.
– and other public vehicles.